We love going sledding and then coming home and warming up with hot chocolate! That’s an easy way to get the kids outside! I get them into soccer or baseball, I encourage them to play with me outside. I love to give them outside time to play. they have been learning how to jump rope. They really like that kind of stuff. They see me do it and then they want to. In our family, we love the outdoors. The kids play soccer, bandy,gymnastics, swimming and martial arts. We keep them very busy. One rule in my house is the kiddos have to be in 1 sport at all times.. I encourage activity throughout the year by participating doing things with them. We play ball, frisbee, go on bike rides and other things that they enjoy doing. I babysit my two and a half year old granddaughter regularly. Since I no longer drive, I ride the bus and or walk, I take a stroller but usually Monroe likes to walk. We go to a park a couple of blocks away, although she isn’t able to do some things, I make sure she gets a chance to do what she can. We also walk around my apartment complex, look at the flowers, trees and squirrels. We encourage activity by playing outdoors since we live in Florida and do not have to worry about cold weather. Great ways to stay active include trips to the park, bike riding, a day at the beach, swimming at the pool, and playing badminton. One rule in my house is the kiddos have to be in 1 sport at all times.. If their not interested in a sport at the time. They have to have a hobby outside of the home such as ice skating classes, or tumbling..
We go hiking a lot as a family and all of the children are signed up for sports throughout the year. This would be great for the backyard playground, where my grandkids and all their friends love to run and play…..Give them some extra motivation to keep moving and stay fit…..
Well for starters what usually works is fun activities. If I am engaged with my child, he is willing to do almost anything. He loves to be on the trampoline and he loves to play soccer and ride bikes with me! i pay attention and find ways that are legit to compliment them. it helps build confidence. it is really a great way to build confidence and show that i am paying attention. I always enrolled my kids in organized sports. They also enjoyed playing outdoors when the weather permitted. I encourage activity in my daughter by taking her to the park often on warm days. When it’s too cold, we play tag in the house. I think the best way is to do activities with them. We usually take our kids to the park or chuck e cheese if it’s raining. They love to run around. My family does a lot of outdoor activities together, so that helps to keep my kids active year-round. We encourage kids to spend time outside by actually spending time outside with them, whether it’s playing hide and seek, or simply raking the leaves. They play soccer, basketball and crosscountry at school. we try to encourage them to do activities with us. My daughter likes to use a bouncy ball and a tumbling mat to keep active. This seems like an awesome idea! We have our grandchild and try to get them out of the hose by taking them for walks around the neighborhood which has a Troll bridge. We throw pebbles into stream We go to the malls where they cab run, jump and play in the play area. We go to the zoo znd other. I encourage my kids to play outside, we go for walks together and to the park. My youngest saw this on tv and has asked about it. Would love to win for him. We like to keep ours kids active by getting outside and playing sports! In the summer/spring/fall we try to do a lot of walking!!! Walk to the park, walk to get ice cream, etc. In the winter I am awful!!! Indoor playgrounds help a lot!! I get my family to go biking or running together on the weekends. WE sign up for sports and we go on family walks. We actually have a pull up bar in a doorway in our house that our girls loves to hang on. Love this idea (from a PE teacher). We have a park within walking distance of our house that has a walking path, I always ask my dtr if she would like to keep me company will I walk. She is signed up for a skate for free program as well. We go outside as much as possible. There are some indoor play areas around town during winter which is nice as well. We walk on the boardwalk just about all year, and we also walk our neighborhood too. I draw the line at hurricanes and or thunderstorms. My nephew would LOVE this 🙂 I’d love to give this to him for Christmas 🙂 Thanks guys! I’m a Mama of the south too! 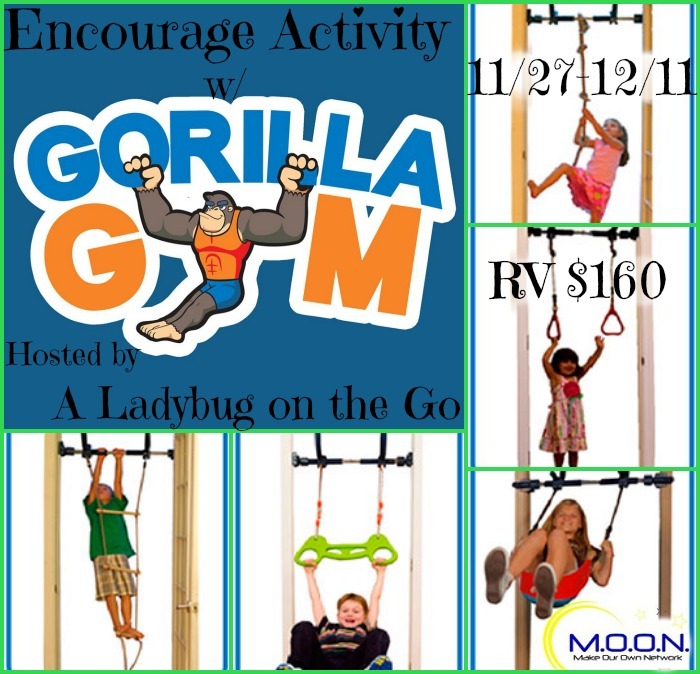 My daughter is so excited about the gorilla gym, she has been wanting one since the first time she saw the commercial. I would put it in my back yard. My grandson would like it. My twins saw this on tv as a commerical. They really want one. This will also prolong the life of their bunk beds that they currently use as a gym. My youngest can literally scale our doorway in our kitchen, this would be a hit with her! My boys would really love to play on this on a raining day. And considering it rains quiet a bit here it will be perfect. My boys would love this! They have so much energy and we needed this! Thank you for this giveaway!